Expeditions such as the Silver Queen require significant sponsorship not only to accomplish the flight itself, but to cover the considerable expenses of planning, logistics, permits, and developing educational material. The Vimy Aircraft Project is made possible through the efforts of Peter McMillian, generous sponsors and donors, and a staff of volunteers. Without these people, the Vimy would literally never get off the ground. Please contact our office (vimystaff@vimy.org) to discuss sponsorship options. 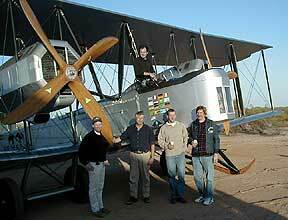 Vimy volunteer pilots on arrival in Aguila, AZ in April 2000. Top: John LaNoue. Bottom: Peter McMillan, Mark Rebholz, Shawn Mulligan, and Erik Durfey.